Many people know that disk fragmentation can cause performance issues. What people don’t know is out-of-the-box, Windows 7 can be configured to run its built-in defrag tool on a schedule to keep disk fragmentation down to a minimum. Here’s how to enable it. Over the years here at groovyPost, we’ve shown you many ways to optimize your PC. 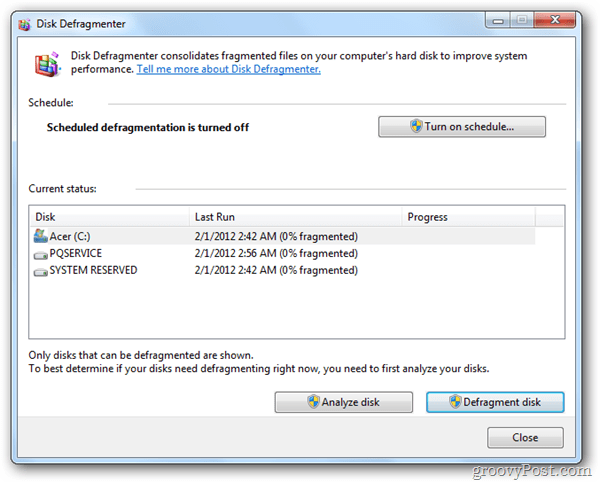 One method for PC’s which don’t have SSD drives is running a disk defragmenter. Defraggler from Piriform is a great free tool for doing just that however if you don’t like using 3rd party tools, here’s a tip for configuring Windows 7 to run the built-in Windows defrag tool on a schedule to ensure your drive stays nice and clean… and fast! Click the Start Button >> All Programs >> Accessories >>System Tools. Click Disk Defragmenter. Click Configure Schedule / Turn on Schedule. I recommend weekly for standard use. Also make sure that your PC needs to be on so pick a time when you will have your PC on. 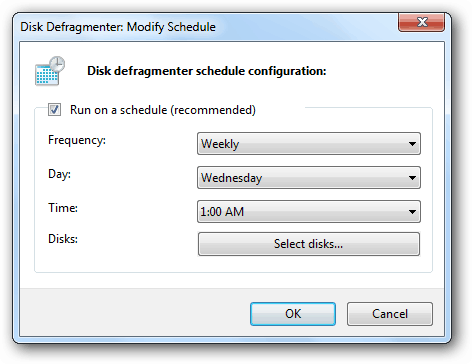 Once you’ve selected your time, click OK, and then close Disk Defragmenter. 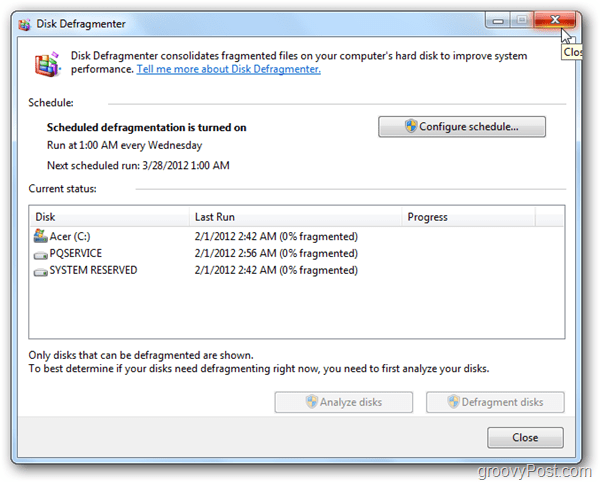 If you use any solid state drives, you’ll want to make sure defragmentation is disabled for them. Defragmenting an SSD is unnecessary and can decrease the life span. @Chris: Auslogics Disk Defrag seems o.k. Personally, I don’t think defragging is as necessary in modern versions of Windows, XP yeah… after that I don’t think I have ever defragged. Always make sure to back up first before running it. @Brian: Tend to agree with you, Brian. Though I’ve used a few defraggers I think they are a waste of time on a modern machine. Never really noticed any improvement with this type of software and, yes, they certainly can shorten the life of your Hard Drive as they rewrite each sector of the hard drive. Quite a number of reputable people have debunked defraggers and I think rightly so. They’re somewhat like registry cleaners – not really needed and a little bit of snake oil about them. Enough With the Infographics Already!